Find all of your pole vault items that Vaulter Magazine has to offer. One break is under your belt, and soon you will be on to your next long break for Christmas. Keep that body healthy and train for that opportunity that you have always waited for. This is what you have always dreamed of, getting to jump for your high school, or even better, a major University. So get out there and show them what you're made of! On the cover, we have Stephen F. Austin University. Not only is Eastern Texas a serious hot bed for pole vaulting, but Samantha also talks about what it takes to jump for this fine institution. 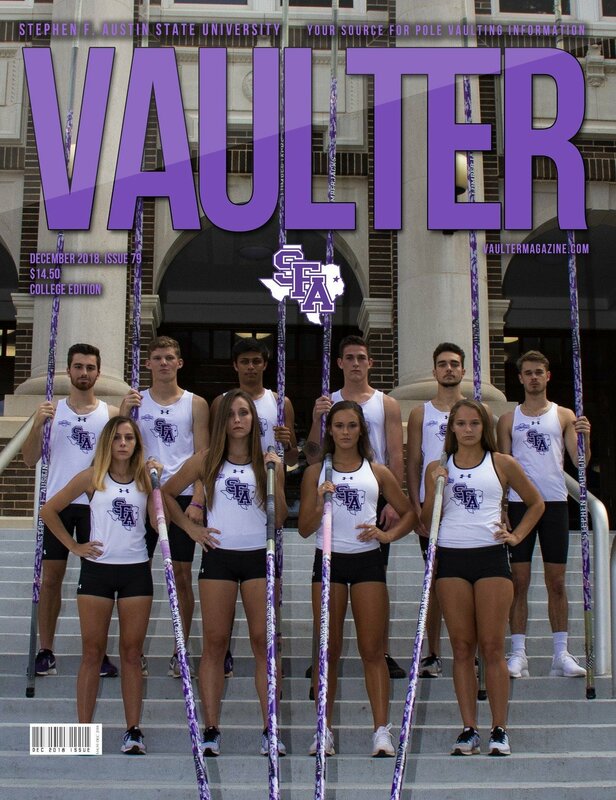 "The SFA team is a strong group of talented and dedicated vaulters who are by no means boiled down to the equipment they use." This is a great read about a pole company and a college team working hand in hand to get the job done. The very so often and dreaded ankle sprain!Yes, Kreager is writing this month about a topic near and dear to all our hearts. I have fallen prey to many ankle sprains, and this is just another example of ways to protect and heal the ankle. "While wearing ankle braces or taping the ankles before physical activity have both been linked to reduced rates of ankle injuries, strengthening the ankles and increasing mobility are more long-term, cost-effective solutions."